Participation in the whiskey appreciation community inevitably draws one into the illicit, cross-border trade in whiskey samples. Aficionados spread across the globe traffic small quantities of the spirit among themselves. In doing so they overcome issues with local availability (it's hard to buy Japanese whiskey in Ireland, for example) and also reduce the considerable expense of sampling a wide variety of expressions. The bottles should not leak, even with changes in air pressure within the cargo hold of an airplane. The package should be light to minimise the airmail tariff. The package should not look like it contains whiskey since some countries have severe restrictions on alcohol imports and will destroy anything that breaches the rules. The US and Canada seem to fall into this category, according to online chatter. There is more than one way to skin a cat but I present below one system that has been successfully tested between Ireland and Japan. Four 30ml samples were sent by standard airmail for a cost of under €4. A standard cardboard postal tube. This one is about 34cm long. A longer version is available. It's quite strong and won't deform under a heap of mail. 30ml bottles from Muji. These are designed to hold liquids when travelling. They are made from rigid PET, the same kind of plastic used in drinks bottles. The cap screws down tightly and is supplemented by an inner stopper to further reduce the possibility of leaks. Four of these bottles fit comfortably in the postal tube pictured. A 50ml size is also available though 30ml is sufficient for a proper tasting. 50ml is the capacity of a glass whiskey miniature bottle, often reused for sample trading. The 30ml bottles cost €1.95 each in Ireland. The Japanese label tells me they sell for the equivalent of €0.56 in Japan so stock up when you are passing through Tokyo. Muji also sells a little plastic funnel to help when filling the bottles. Bubble wrap to roll around the stack of bottles, wedging them within the tube. Wadding to pack in the ends of the tube. It's probably best if this is absorbent, like scrunched up newspaper, in case of leakage. A customs label. 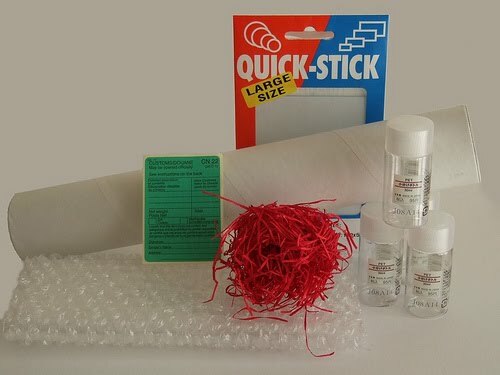 The post office supplies this but it saves time to have a few at home for filling out in advance. There is a box to tick for 'gift' but you also have to specify what's inside. As mentioned, if you write 'alcohol' or 'whiskey' there is a chance it won't get past customs. You could write 'malt', or 'barley juice' perhaps. The packaging described here is very light so it's not at all obvious externally that it contains any sort of liquid. Wink, wink.